We have achieved protein imaging mass spectrometry capabilities at sub-cellular spatial resolution and at high acquisition speed by integrating a transmission geometry ion source with time of flight mass spectrometry. The transmission geometry principle allowed us to achieve a 1-μm laser spot diameter on target. A minimal raster step size of the instrument was 2.5 μm. 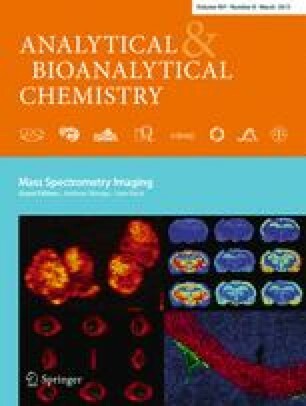 Use of 2,5-dihydroxyacetophenone robotically sprayed on top of a tissue sample as a matrix together with additional sample preparation steps resulted in single pixel mass spectra from mouse cerebellum tissue sections having more than 20 peaks in a range 3–22 kDa. Mass spectrometry images were acquired in a standard step raster microprobe mode at 5 pixels/s and in a continuous raster mode at 40 pixels/s. The authors would like to thank George Mills (SimulTOF Systems) and Boone Prentice and other members of the Vanderbilt Mass Spectrometry Research Center. This project was supported by grants from National Institutes of Health National Institute of General Medical Sciences NIH/NIGMS P41 GM103391-04 and NIH/NIGMS R01 GM058008-15. SimulTOF 200 Combo | SimulTOF Systems. http://www.simultof.com/content/simultof-200-combo.